← Who the Heck was Homer? The Davenport Project is pleased to announce the release of Timothy Woodbridge Davenport: The Collected Works, from Liberal University Press. Compiled mainly from papers written for the then-new Quarterly of the Oregon Historical Society, this new collection offers a unique and forgotten aspect of the Oregon Country, through the writings of this forgotten Oregon Statesman and Pioneer Philosopher. Timothy Woodbridge Davenport (1827-1911) is known today as the father of W.R. Hearst political cartoonist Homer Davenport (1867-1912). “T.W.” was born on July 30, 1826, in Columbia, New York. His family moved frequently until settling for over a decade near the town of Woodstock in central Ohio, where his father Benjamin had a medical practice. In the spring of 1851, the Davenport family emigrated to Oregon, arriving that autumn in the Waldo Hills several miles south of present-day Silverton. 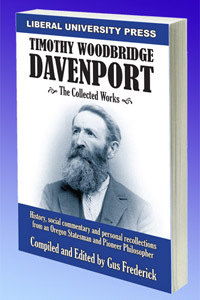 Over the next half century, Davenport was personally involved in the new state of Oregon politically, serving in numerous capacities, including Special Indian Agent, County Surveyor, State Representative and Senator as well as being appointed Oregon’s first State Land Agent. The last decade of his life saw a flurry of written essays, covering a wide range of topics; both observations and personal recollections. Most of these were printed in the new Quarterly of the Oregon Historical Society. Now for the first time, they are presented in a single volume, allowing researchers, history buffs and others a unique view of late 19th century Oregon, through the progressive pen of one of this State’s leading pioneer intellects. The book will be available online for $25, as well as locally through the Silverton Country Historical Society. This entry was posted in History, Media. Bookmark the permalink.